Based on my understanding, this is a standard Macro Cell with all functionality available from the day it is launched except that the PA+LNA+Filters+Antenna Panel (DOT) is extended remotely over Cat V cables. You can have multiple dots connected to a single cell based on the requirement as per DAS architecture. Now the Base Band Board and Radio Head may be centralized for the building. So this architecture may not really comply with C-RAN concept, so lots of features of C-RAN can't be supported with this. This is the very first step towards a centralized LTE DAS architecture for a big network. I think this is going to be a costly solution because of the architecture. One thing which is not known if this is based on SoC or the standard DSP FPGA based solution, because cost will be drastically low if it is based on SoC. 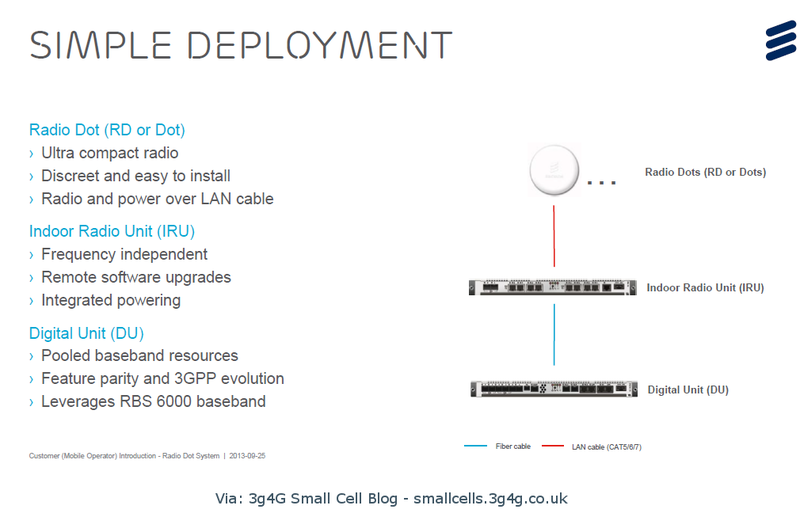 Now it is interesting to see how the big carriers are taking this, since it is going to be launched in the second half od 2014, probably a very flexible hybrid DAS solution based on SOC will be available from many of the leading Small Cell Solution providers. After my discussion with Ericsson executive, he explained the dots can be configured as different cells than the macro cell (in case the BBU is used for macro as well as indoor cells as posted in link to Ericsson document on page 11).